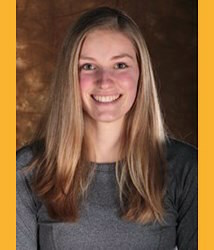 St. Olaf 2014/15 (First Year): Margaret’s 2014 fall record for singles matches was 6-0 and doubles was 4-2. In September of 2014, Margaret and her doubles partner advanced to the quarter-finals of the ITA tournament. Margaret was 2-2 in first singles play with partner Alisa Hall at the beginning of the season. She switched partners to Kristi Kroker, and the pair went 6-8 in first and second doubles play. Zimmermann went 4-3 in third singles play and 3-3 from the fourth singles position. This entry was posted in 2014, Athletic Alumni by Communications Department. Bookmark the permalink.